Glass doors are sleek and attractive. Made of strong glass, these doors add a signature touch to any building design. Security services in New York are available to install all types of doors and set the locks and alarm sensors correctly to work with the complete security system. When updating your building’s security system, especially during renovations, you need to call experts in the field of security systems. Hulk Security Systems NYC is a perfect example of the ideal team to handle all of your security needs with outstanding security products installed by well-trained professionals. 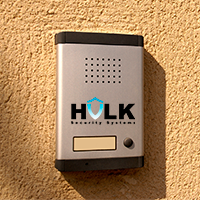 Hulk Security Systems is ready to listen to what you want for a security system as well as door installation. Glass doors are made from a heavy glass that is capable of withstanding impact. It may look fragile and clear, but there are many advantages. Security personnel can see through these doors and know who is coming. There is no mystery when the front door is opened. Security cameras are more capable of capturing different angles of the scene near doorways. Hulk Security is one of many security services in New York, but we have a standard that has carried us for years and we have provided high-end security from every angle for many, many satisfied customers. If you need Glass doors installed in the most secure and professional manner, we are available 24 hours every day of the week. Just contact us with any questions and take advantage of our free estimate. We look forward to providing you with the best security products and services that you can find.